National Convention in New York This Month—Railroads Are Ready to Fall in Line with the Plan to Set Clocks Up May 1. Ben Franklin first wrote about it during the country’s early days as a way to save money on candle wax. However it was the passage of the Standard Time Act of 1918 which established both standard time zones and set summer DST to begin on March 19, 1918. Though the rationale was to save fuel, the U.S. Chamber of Commerce backed the plan because when people get off work and it is still light, they are apt to go shopping in the evening. Sports and recreational activities also profited. Baseball fields were not artificially lit, and this allowed for more time in the evening to play games. Golf also had a boost as people could hit the links after work in the daylight. But many others did not like the idea. Some warned it was “taking us off God’s time”. Movie theaters were affected in that people did not want to go into a dark theater when it was still light outside. But the farmers protested the most as they had less time in the morning to get their milk and harvested crop s to market. 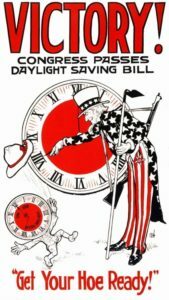 Those against Daylight Saving Time won the argument when Congress did away with it by overriding President Woodrow Wilson’s veto that October, even before the Versailles Treaty was signed. 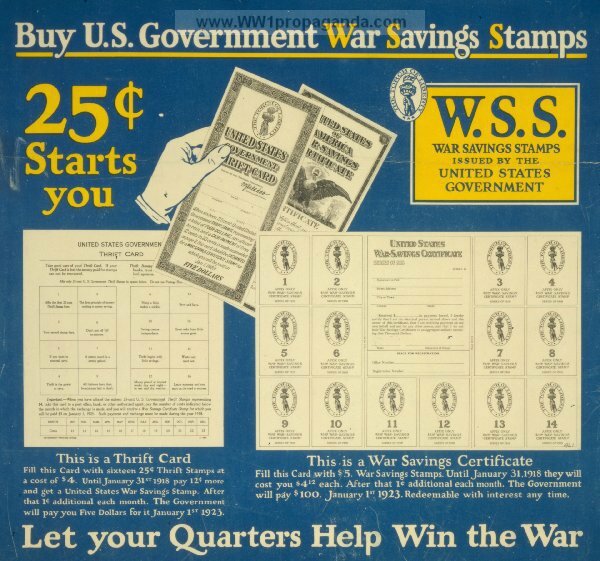 DST became a local option and was observed in some states until World War II, when President Franklin Roosevelt instituted year-round DST, called “War Time,” on February 9, 1942 for everyone. That lasted until the last Sunday in September 1945. The next year, many states and localities adopted summer DST. But time remained confusing with different cities and states choosing and not choosing to adopt it. 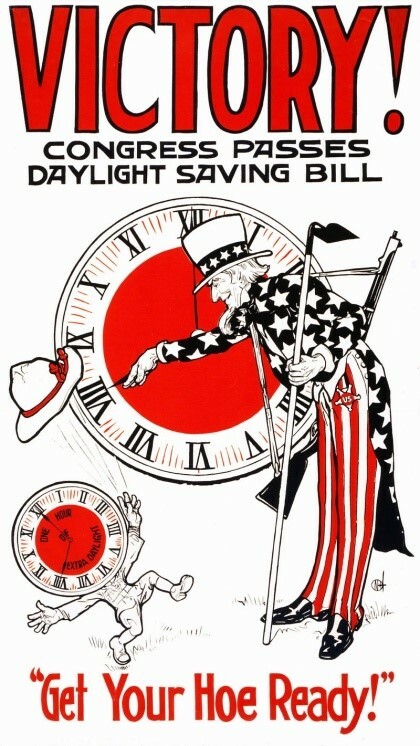 President Lyndon B. Johnson signed the first peacetime Daylight Saving Time law which forced states to opt in or opt out. In 1973, again worried about fuel during the oil embargo, President Richard M. Nixon called for year-round Daylight Saving Time. It was unsuccessful partly because of the danger of children going to school in the dark. Today with the exception of Arizona, Hawaii, Puerto Rico, the Virgin Islands, American Samoa, Guam and the Northern Mariana Island, the states observe eight months of Daylight Saving Time. This entry was posted in Uncategorized on March 9, 2018 by Joan Weaver, Kinsley Library Director. The next letter from Private B. K Lesley is a month later with him still in France. It is dated December 16, 1917 and was published February 7, 1918 in the Kinsley Mercury. He has received a letter from his brother James asking him to describe France. His vivid description is still difficult to read today. “You ask me to give you a description of the country. Would that I could comply. Since that September dawn when the gentle fingers of the morning breeze drew the clinging curtain of mist and revealed to our eager gaze the gold crowned hills of sunny France, I have seen sights which not only baffle description but hold the imagination enthralled to such an extent that the mind almost refuses to dwell upon common things. According to ones spirits one is impressed. The winding lanes, the verdantly green slopes. The trim copse, the villages with their multi-colored houses and the red tile roofs at one time impress one, at another it is only the filth and squalor one notices; but at no time can one get away from the awful realization that the country is bleeding, bleeding from the millions of wounds, and that a terrible combat is close at hand. To the south it is true the roar of the guns is lost in the distance, but the once peaceful villages are peaceable no more; always there are moving troops, moving transports and moving wounded, moving north and south. But the country retains its natural beauty, its hills and valleys, its brooks and streams, its woods and meadows playfully catch and reflect the passage of fleecy clouds across the azure sky as though war was the childish pastime of mortals but of no interest to them. A few kilometers north and we see the same moving troops, transports and wounded moving north and south and the sound of the guns become audible, faint at first but with gradual increasing force and destruction until, when quite close, it sounds as though some angry God was striking with all his might upon the major chord of some titanic instrument and the ruins caused by looming on in Tritgies (German for Strategies) early onward rush become more numerous. A few kilometers more and, thank god, you can’t see it. It is desolation grim and terrible, even nature has not been able to stand against it. For miles and miles, as far as the eye can reach there is nothing green, nothing living; trees, grass vegetation; all are gone. There is only mud and interlacing shell holes. The villages and farms which were, are only crumbled heaps of ruins, grim trophies of this awful game and always the disappearing army is moving, moving grandly, majestically, tragically to its predestined end. Moving north into the vortex of war’s awful caldron and the wounded are moving south. 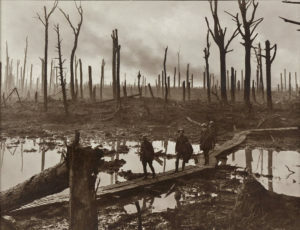 I think that Private Lesley went across the channel to France sometime in September, 1917 because he wrote the following in a letter that will be the topic of my next post: “Since that September dawn when the gentle fingers of the morning breeze drew the clinging curtain of mist and revealed to our eager gaze the gold crowned hills of sunny France”. But before that letter, there was this one, dated “France, November 12, 1917” (Kinsley Mercury on December 6, 1917). 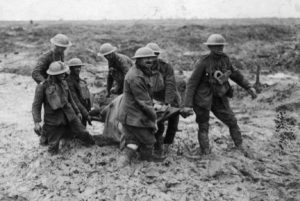 The 47th Battalion was participating in the Third Battle of Ypres in West Flanders from July to November. It is also known as the Battle of the Mud. 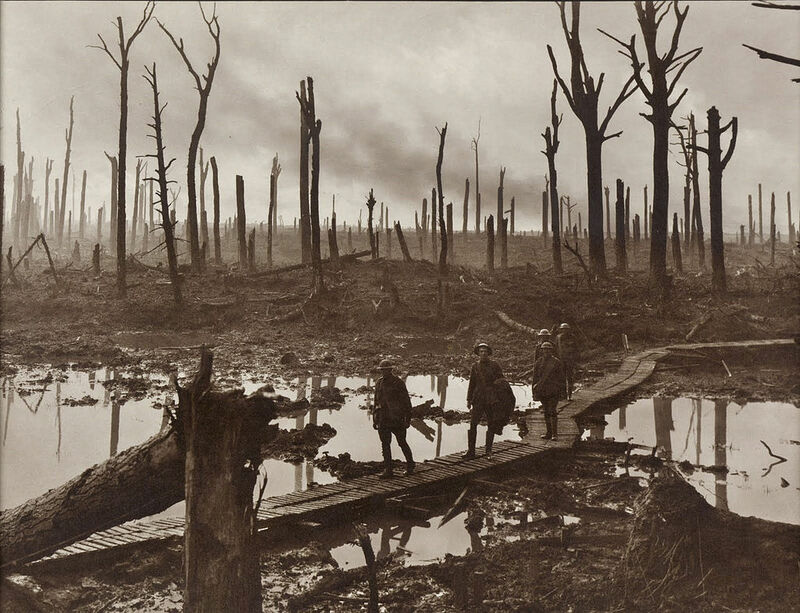 The campaign ended in November, when the Canadian Corps captured Passchendaele. This offensive remains quite controversial because of the 700,000 casualties to both German and Allied troops which resulted in a gain of just five miles of Allied land. I will drop you a few lines to let you know that I am all right and getting along fine. I have been in the hospital for about nine days with a mild case of blood poison in my heel, but am about well now. Am in a convalescent home now but will be going up the line again in a few weeks. The hospital is the best place out here. Up the line at the front the mud is something fierce and our friend Heinie was also some fierce, too. It is sometimes warm but not so bad as you might think by reading some of the newspapers. The shells are like the snags in the Mississippi river; they don’t hurt you so long as they don’t hit you. We are blessed with lots of rain here. Today is the first fine day I have seen for a dog’s age. I was in the toughest spot I have been in so far from the 20th to the 30 of last month, but don’t suppose there will be much more hard fighting this winter. I see there is an American section on the line now, but don’t know where it is as I have not seen many of the troops and they don’t seem to know much about it but might run across some of them later on. According to his army records record, Ben’s heel was treated by a field ambulance on November 1 and then was treated in the hospital in Rouen, France. He convalesced in Buchy, France until he was discharged back to the base on November 29. Private Bennett Lesley arrived in England on the HMS Olympia. 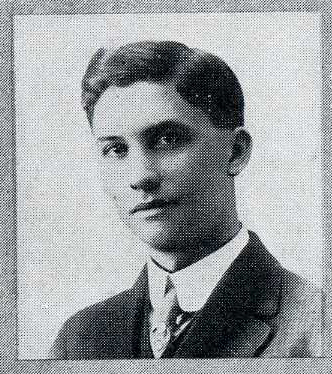 The June 16, 1917 letter published in the Hutchinson News goes on to describe his impressions of England and how different the country was from the wide spaces of Kansas and British Columbia. “England is a great country. It looks like a big park. Everything here is just as green as can be, that is everything but the inhabitants and they would skin a flea for his skin and tallow.” (Note: This is an old expression meaning stingy). There is quite a food shortage here now. You can’t get any white bread in the country. It is all whole wheat flour that is used and that is not over plentiful, but it is all right at that. I am in a military camp in the south of England right close to the seashore. They have the most comical railroad trains in the country that you ever saw. The cars are small and divided up into compartments that hold about eight to twelve persons each, depending on the size of the person. They are fitted up about as comfortable as a “box” car. The doors are on the side and the windows are small and cannot be opened. Why an alleged civilized people will ride in such trains is more that I can see. They don’t even carry a water tank in the passenger cars but they certainly run like a scared rabbit. We made about fifty miles per hour from where we disembarked to here. There is no use telling where we landed as the censor would blot the name out. 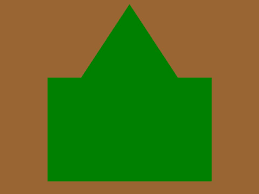 That is to keep any information concerning the movements of the troops reaching the Germans. “England is a pretty country and is laid out just like a big park. You would laugh at the farms. The land is divided up into small plots of all sizes and shapes with hedge fences dividing each field and none of the fields are square with the world. They are all three, five or six cornered and the hedge fences take up more land that the fields so that out of a forty-acre field there are about thirty acres of useless hedge fences and ten acres of tillage land. No wonder there is a food shortage here. I was just watching a man plow. He used one horse and a little dinky plow about four inches wide. He might cultivate an acre a week. His plow was about the size that Doukhobor rancher (Spiritual Christian religious group from Russia) in Saskatchewan would harness his wife up to. There are all kinds of airplanes here. You can see them flying around all the time and they sure can travel I am going to London next week for a few days and will let you know what the town looks like the next time I write. I am going to France in five months or more. This entry was posted in Uncategorized on March 7, 2018 by Joan Weaver, Kinsley Library Director. When I sat down to write today’s post, I didn’t think it would take long. Four hours later, I’ve gone down a trail that has proved to be very interesting. The editor of the Kinsley Graphic prefaced a letter published December 6, 1917 as “B. K. Lesley, formerly of Lewis but now in the Canadian Infantry in France, writes to his brother J. H. Lesley of Lewis as follows:”. That statement made we wonder what a Lewis man was doing in the Canadian Infantry. Through Find A Grave, I found that B. K.’s name was Bennett King Lesley. He died at 90 years old on January 27, 1975 in Vancouver, British Columbia, Canada. He was born in Lewis, Kansas, 134 years ago on March 9, 1884. Subsequent research revealed that his parents, Henry and Martha Huckstep Lesley, were early pioneers having come to the area in 1879. They had four sons and four daughters. Martha died in 1900 when Ben was just 16. Henry served on the school board, and his daughters taught in schools, but I found no record that Bennett graduated from high school. 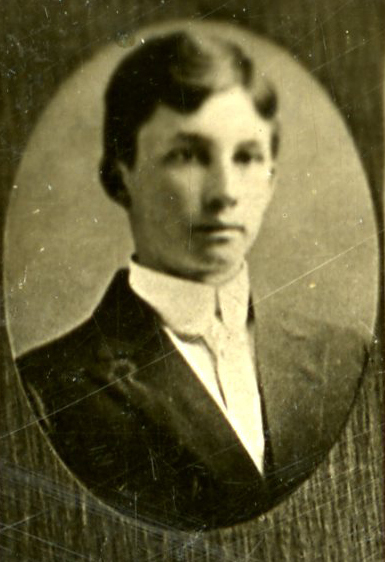 One of Ben’s older brothers, Herbert, died in 1909 when he was kicked by a mule. I could not discover exactly why and when Ben left Edwards County. He is not mentioned in the newspapers during the years before the war. 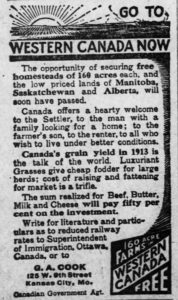 However, from 1903 thru 1914, Canada was heavily promoting homesteading opportunities in western Canada. I found mention of several other Edwards County men investigating and/or moving to Canada. 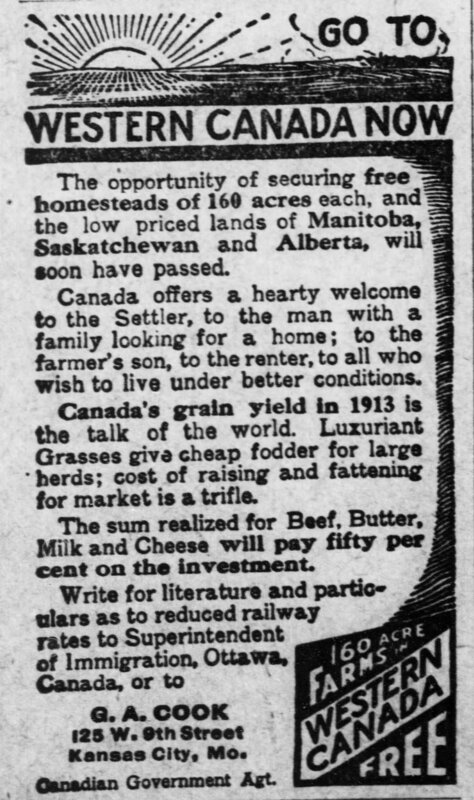 The Kinsley Graphic of April 14, 1910 reported, “The exodus of our good citizens to Canada is steadily increasing,….It is estimated that not less than fifty thousand heads of families, most of them successful farmers, expatriated themselves in 1909 and took up home under the British flag….The lure of cheap land is strong, and as long as the Canadian Northwest offers its virgin prairies to home seekers at low prices, the rush of settlers is likely to continue.” Perhaps Ben saw a better opportunity for himself in Canada and had been living there for a few years before the war. 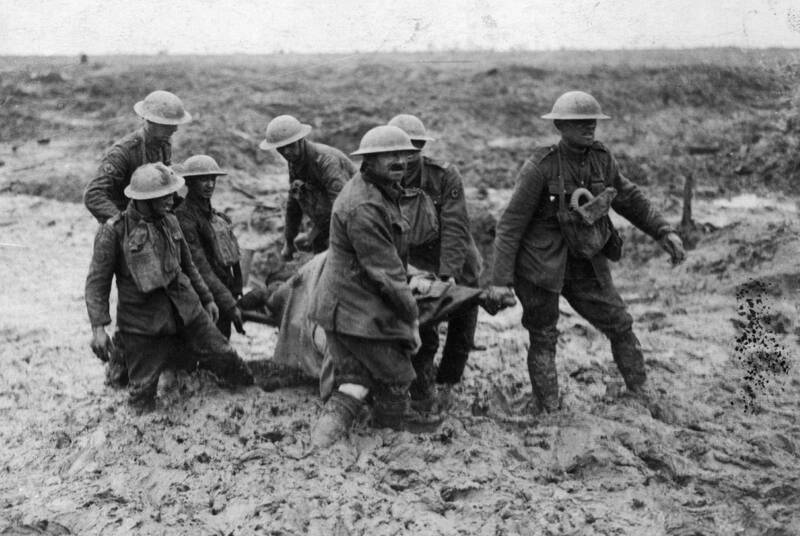 Of the 619,636 soldiers in the Canadian army during WWI, at least 35,612 were American citizens by birth. Some American men were angered by the 1914 invasion of neutral Belgium by the German armies attacking France. Some felt the United States should help defend France, which had been its staunch ally during the American Revolution. Some may have just been seeking adventure. Whatever the reason, I do know that Ben Lesley joined the Canadian Overseas Expeditionary Force on November 24, 1916 in Vancouver. At this point, I found B. K. Lesley’s complete Canadian army records online. So far, I do not have a picture of Ben, but he is described as 32 years of age, 5’ 10 ¾”, medium complexion, brown hair, gray eyes, 20-20 vision, perfect hearing, and no fillings or dental problems. By trade he was an engineer and by faith, a Methodist. 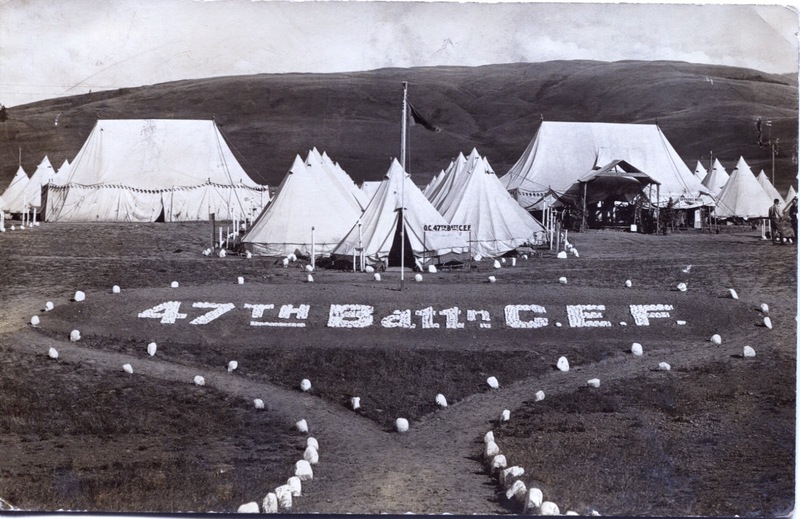 He was #2020155 and assigned to the 11th regiment of the 47th battalion, Canadian infantry. He trained, perhaps at New Westminster, BC. On May 28, 1917, Private Lesley sailed out of Halifax for England on a British ocean liner, the RMS Olympic. I doubt Ben knew it, but his father had died back in Lewis the day before he sailed. 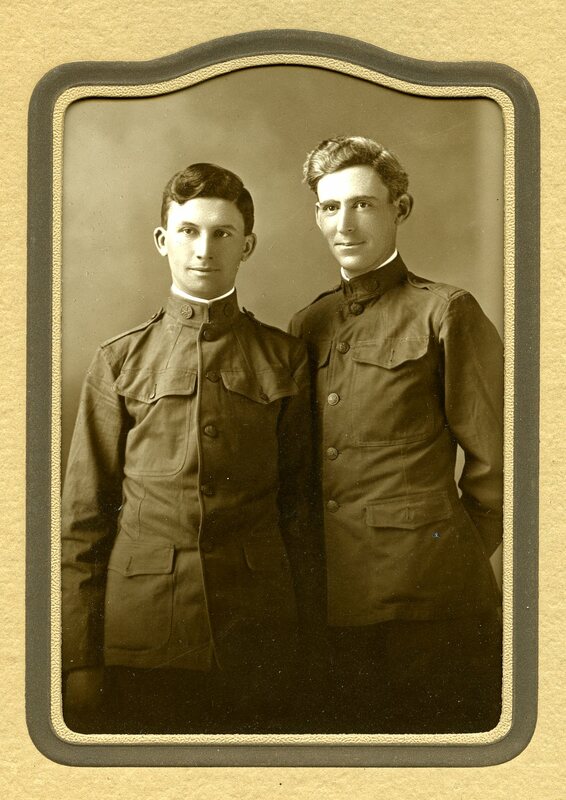 In a letter written on June 16, 1916 to his brother James, Ben describes the journey. Besides having a calm sea, Ben’s trip was enhanced by the “fine boat” he was on. The RMS Olympic, which was launched in 1910, reigned as the largest ocean liner in the world from 1911-1913 except for the very brief time that the RMS Titanic sailed on her tragic maiden voyage. The Olympic and the other large ocean liner of the day, the HMHS Britannic, had been turned into troopships. The latter struck a mine and sank off the coast of Greece in 1916. The Olympic survived the war and sailed until 1935 earning it the nickname “Old Reliable”. During the war, Private B. K. Lesley wrote letters back to his brother James. 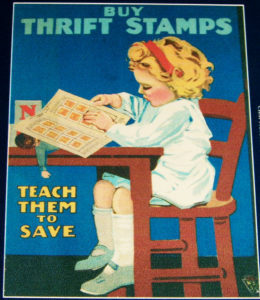 I’ll share one with you in my next post and then from time to time as they appear in the papers of 100 years ago. This entry was posted in Uncategorized on March 5, 2018 by Joan Weaver, Kinsley Library Director. Doing research can sometimes be a challenge. Today’s post involves a letter from Augustus P. Hann to the editor, James M. Lewis, of the Kinsley Graphic which was published on February 14, 1918. 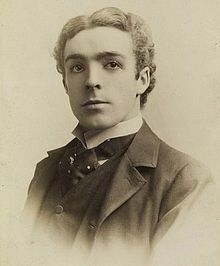 I had come across A. P. (Gus, Gust) several years ago when I was researching the literary women of the area. He and his widowed mother, Ila Taylor Hann, had come in 1908 to Edwards County where her father, James D. Taylor, and brother, E.D. Taylor, were prominent ranchers and business men. It took me quite a while to figure out that a Kinsley lawyer and founder of Jetmore by the name of Thomas S. Haun had divorced his wife in order to marry Ila in May, 1911. Thus, Mrs. Hann became Mrs. Haun. If that was not confusing enough, finding out about Gus was made more difficult when his name was misspelled “Hahn” in the Kinsley Mercury. If you are into genealogy research, you know that name spelling can cause problems. Three months later, Gus wrote this thoughtful letter back home. No matter what one thinks when we go into a thing, it is always lots different than it looks. We talked about it being a long time until we could hear from each other, and believe me it has seemed like months to me since I said good bye, to all of you, and all that is near and dear to me, except the cause that brought me here on this wild storm-ridden, and still magnificent ocean. I hope it may be my lot, to return to all of you and tell you about it. It is indeed an experience of a life time and were it not for the fact that a torpedo may decide at any moment to make us vacate in its favor, it would be a very pleasant life indeed. We have nothing to do but ride, how many miles we have gone has long since failed to be of interest. The prime factor now is how long will be before we see some land. Once in a while we see a ship at a great distance, but very seldom close in on one. Have been on board twenty one days today without getting our feet on land. Most of the fellows take it as a matter of course, which is the best way, but some have an awful time wondering and surmising and fretting, because things do not suit them. It has been very cold a couple of times. Altho it was fine while we were in the Gulf Stream. We are learning a little French, but I have an awful time making my mouth believe that it was ever meant to be twisted up in that manner. I think that I shall have to talk with my hands or get a new mouth. The room steward on this boat was a Belgian. The Germans carried away his mother and two sisters, when they took Antwerp, and killed his wife. He has three little bits of tots. We have several sailors that have been on torpedoed ships, and it looks a great deal different when one learns that all the things that we heard really did happen. Well Jim I don’t suppose I ever before sat down and wrote letters, that I didn’t know whether they would ever get mailed or not. But I am sure doing it tonight. But I am not regretting it. I would hate to “go out” without getting a whack at the Huns. But if such is my fate that it will have to be. Now course all my life, there have been lots of things that I have regretted and at a time like this you feel them that much worse. But Jim I am glad I am here; this is America’s battle. It is our war, as much as anybody’s and I cannot help but believe I will get through it alright. I hope you have all managed to keep well, I am feeling fine. Just a little blue once in a while. We get wireless news every day and I understand it has been very cold in the States, I hope you had a good snow along with it, to help out in another year’s wheat crop. Any time you think it is a joke about Uncle Sam’s gunners being good shots, you miss it. These sailor boys played around with a barrel the other day that was floating around out here in this pond in a way that would make a strong man sick. Believe me there isn’t money enough in the world to tempt me into a barrel they are going to use for a target. Well it is getting pretty late now. I understand we will be limited in the amount of mail that we send. If such is the case my letters will be few and far between, but whenever you can, write me. I will be glad to hear as often as I can. This entry was posted in Uncategorized on March 2, 2018 by Joan Weaver, Kinsley Library Director. 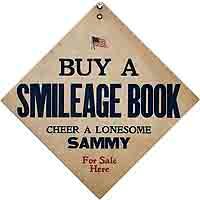 While reading the newspapers, I ran across “Smileage Books”, yet another way the people at home were being asked to support the soldiers. An article explaining this new program was written by Harry P. Harrison, the chairman of the Military Entertainment Council (Kinsley Mercury, January 31, 1918). This council was to provide programs of entertainment for the soldiers in the National Guard and army training camps within the U.S. 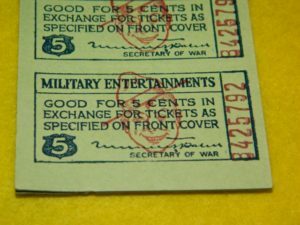 Admission cost was from 10¢ to 25¢ per seat to see Broadway plays, vaudeville shows, concerts, lectures and also amateur productions put on by the soldiers themselves. 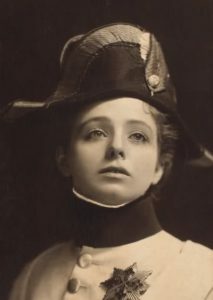 Two prominent actors who immediately signed on to perform were the beautiful Maude Adams, who played Peter Pan on Broadway in 1905 and the dashing William Faversham. 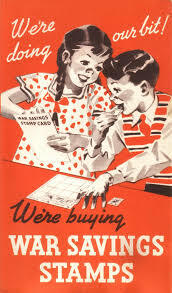 These entertainments seem to be forerunners of the USO performances of World War II and the wars to follow. 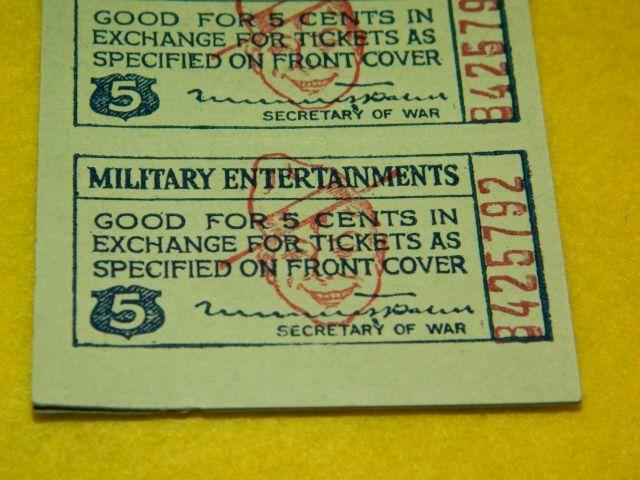 The article also reports that as cheap as the council is making the entertainments, many soldiers would not be able to attend because “Thousands of them are sending home practically all their pay.” The solution is for people to purchase them for not only their friends and families but for other soldiers who may not have anyone to buy books for them. This entry was posted in Uncategorized on February 26, 2018 by Joan Weaver, Kinsley Library Director. The February 21, 1918 issue of the Graphic made another plea. 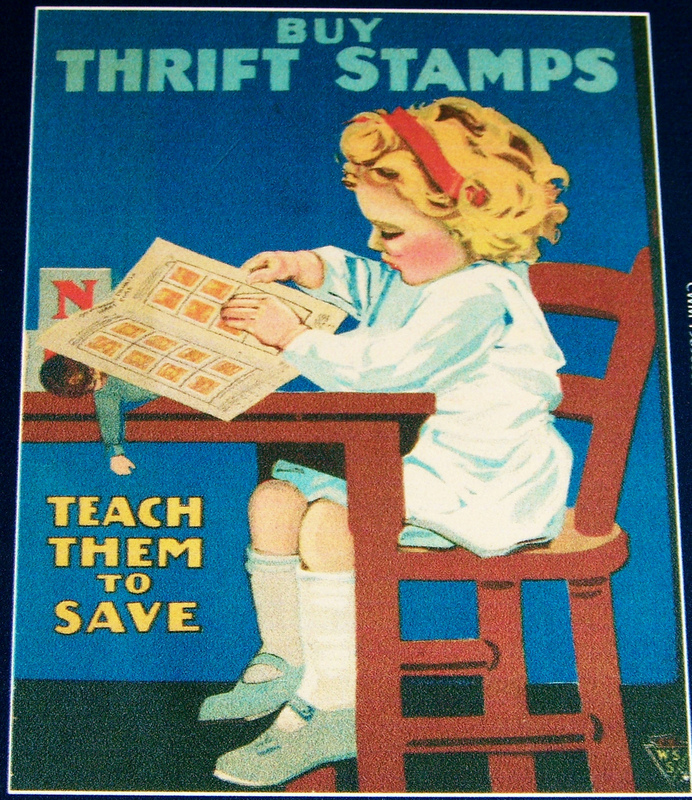 “Can children be taught to save? They certainly can, and this is one of the greatest lessons that childhood and youth need to be taught. It may be a little difficult under ordinary conditions to inculcate in our youth the principles of thrift, but during these stenuous war times it will not require much effort if the advantages of saving are kept continually before our boys and girls. It’s interesting that in recent conflicts neither the general public nor the children have been called on to sacrifice or support our military to such an extent. This entry was posted in Uncategorized on February 20, 2018 by Joan Weaver, Kinsley Library Director. 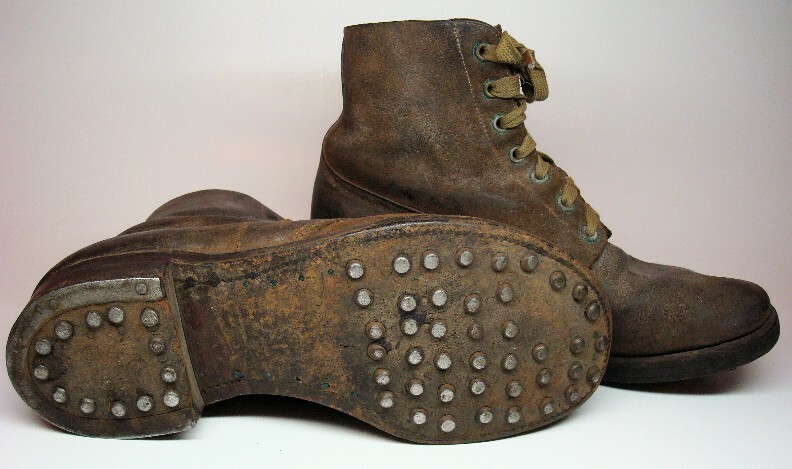 “We were issued the rest of our equipment yesterday, even to bayonets and hob-hailed shoes. Of course, everyone is in love with the hob-nailed shoes. They are so heavy that the two pair we are issued will last the rest of the war, even if it continues for fifty years. At least they feel that way when we walk a mile or two in them. Part of our company is to guard the lake from which the camp gets its water supply, for a week. One day last week an airplane broke a propeller and came down just west of us. A man on a motorcycle saw him coming, so got off and ran. Guess he thought that in a case like that he could outrun a motorcycle. The airplane demolished the motorcycle, however. Last Thursday night the grenade class made a night attack on the snipers’ class. The snipers were in the trenches. We had to crawl through barbwire entanglements. Nearly all of us got stuck in the wire, but finally managed to get through. We had to crawl through on our backs. We use lumps of dirt for grenades, but not one got him, and it ended by both sides claiming a victory. All the corporals and sergeants have been given combination cartridge belts for carrying both pistol and rifle cartridges. We do not have our automatic pistols yet, Am glad we are going to get pistols, as I think I would much rather shoot a German than chase him around trying to get a chance to stick him with a bayonet. They tell us the Germans don’t like bayonets, but I don’t think any of us do either. Well, it is supper-time, and of course I can’t miss out on that. Perhaps the bayonet was like this Remington M1917. Chester had several interesting post scripts to this letter. Through sarcasm, Chester reveals that his uniform was made of 8.2 ounce cotton khaki. This is February and they are about to be sent to France where it is probably still cold and very wet. Wool repels water and at the same time holds heat, so I find it interesting that they are receiving cotton uniforms. Because the dates match, this undoubtedly is Hugh Matthews that I wrote about in Post #46. One of the artifacts that the Bidlemans allowed me to scan for the display is a panoramic picture of the company that was taken in November. I imagine Hugh is in this picture but I have no other image of him to be able to pick him out. It would be good if I could locate a relative who might have a picture so I could do so. PS continued – “Have been helping in the quartermaster’s room for the past two days and have not had to drill much the past week. Chester has been promoted to corporal at this time. Previously he mentions getting the combination cartridge belts and now he talks of lighter duty. PS continued – “Don’t be afraid of getting the socks too heavy, for we can wear socks an inch think with the big hob-nailed boots”. The women back home knitted socks, sweaters, and wristlets for the young men. 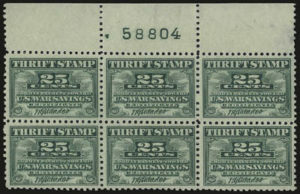 See Post #25 for more information. The letter ends there. I’ll be sharing more from Chester’s letters and diary in future posts as he proceeds to France and fights in the trenches. This entry was posted in Uncategorized on February 15, 2018 by Joan Weaver, Kinsley Library Director. I just changed my foyer display to feature Chester W. Bidleman who served in the trenches in France. Chester’s granddaughter, Lucinda, recently came to visit her father, Bill John. She generously brought in and shared Chester’s memorabilia with us to scan for this display and to archive in our collection. Chester wrote letters and kept a small diary during his months of service. The diary is in such good shape, I can only imagine that he carried it in a small tin box or leather case for protection during those hard days. I will be excerpting Chester’s diary and letters in future posts during the next few months as we follow his war experiences. But first, a little bit about Chester. Chester was born January 18, 1895 in Seward, KS to William and Etta Bell Bidleman. The family came to Edwards County by 1908. Chester graduated from Kinsley High School in 1913. 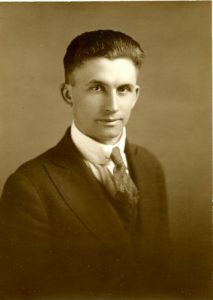 He went on to Kansas State Normal College (Emporia) for two years and became a teacher of mathematics in Greeley, Kansas. According to Chester’s diary, on April 24, 1917 in Burlington, Kansas, he “put down his John Henry to join the army.” He took his physical the next day and was accepted for enlistment into Company C, First Kansas Infantry. He wrote on his Service Record forms that he reported “at a rendezvous” on August 5, 1917. 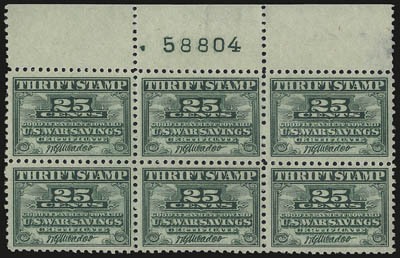 The U.S. Army made getting typhoid shots mandatory for all its enlisted soldiers, and Chester started his series on August 5. He signed a muster roll for the first time on August 31 and received his first month’s pay on September 30. (It is uncertain, but he may have been at Camp Funston during this time. He left Burlington for Camp Doniphan, Oklahoma on September 30 for six months of training. The following excerpt is from a letter which was published in the Kinsley Graphic on February 21, 1918 and appears to be an answer to a letter from his mother. This is the nicest day we have had here for a long while, and can hardly stay inside, as I suppose tomorrow the dirt will be flying again. We did not drill two afternoons the last week, as the dust was blowing so much that we couldn’t see where we were going. The dirt is almost as bad inside the tents as outside. Chester is referring to the February 5, 1918, sinking of the Tuscania. This luxury liner was turned into an American troop ship and was en route to Britain with more than 2,013 American soldiers and a crew of 384 on board. 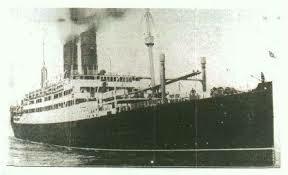 It was torpedoed by the German submarine UB-77 in the North Channel and sank. 210 lives were lost, either by drowning in the seas or being dashed to death on the rocks. The Tuscania was the first ship carrying American troops to be sunk in the war, and the American public was outraged by its loss. Look for more reprinted from Chester’s letter in my next post. This entry was posted in Uncategorized on February 12, 2018 by Joan Weaver, Kinsley Library Director.